And A Nightmare of Death For Her Husband. Prominent Indiana attorney Jimmy Grund thought he'd found the woman of his dreams when he wed his second wife Susan. But beneath the silky blond society lady lurked a calculating, evil-tempered seductress whose murderous future was about to rival her sordid past. While she hid her previous marriages and an appalling crime from Jimmy, she was soon plotting to get her hands on his fortune. When Jimmy Grund finally found out the truth about his wife, he told her he was divorcing her. But no one left Susan Grund. All of Peru, Indiana was stunned when it was revealed the fatal bullet came from a gun stolen from young David Grund. Yet even that paled next to Susan's incredible testimony that she had carried on a two-year affair with the innocent teenager, who denied the affair and was not implicated in the crime. 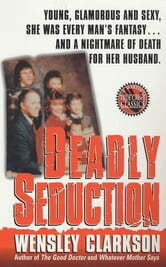 Wensley Clarkson's Deadly Seduction is the story of a real femme fatale, who spun a web of deceit and murder that shocked an entire town.